support (a) SPP mode, (b) coupled S-SPP and SPP modes; (c) experimental; and (d) theoretical optimized structure that support coupled SPP and WG modes. 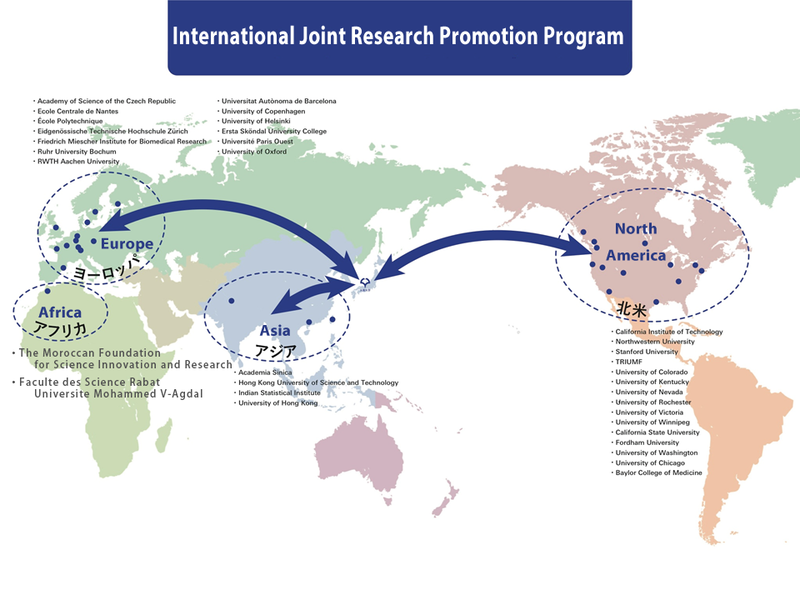 Ms Wafae Qandar is staying at Osaka University for 2 months from August 1st(Mon) to September 30th(Fri) to do the joint research. 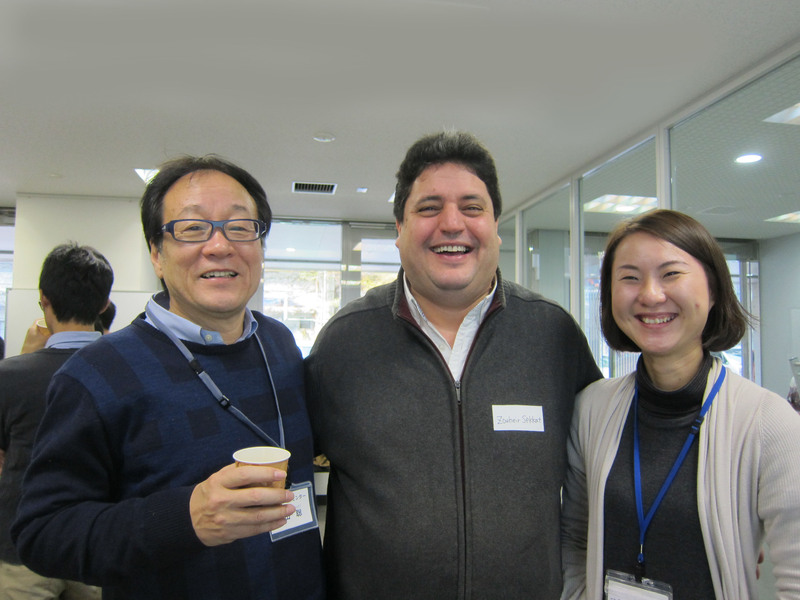 She is attending TMT(Tuesday Morning Tea), Photonics Center together with Prof Zouheir Sekkat, Prof Satoshi Kawata (left) and Dr Kentaro Mochizuki(right). 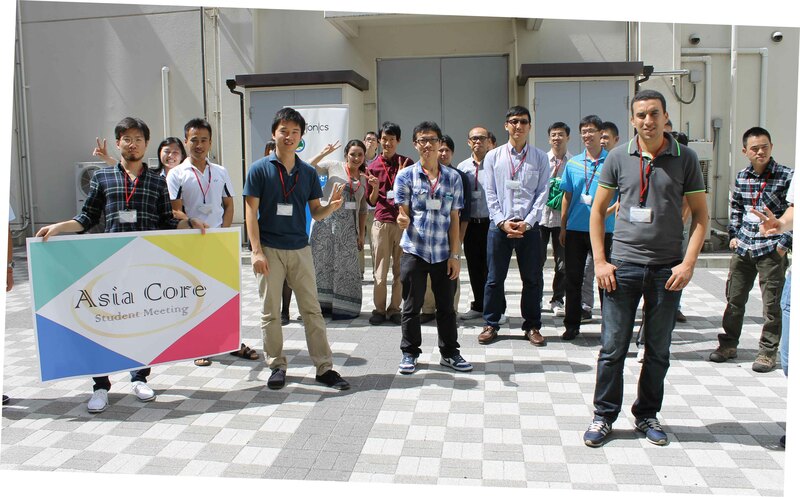 Joint research on 3D nanofabrication is introduced at the ResOU, Osaka University Homepage as "Hitting the bull's-eye with 3D nanofabrication". Reference: Sekkat, Z. 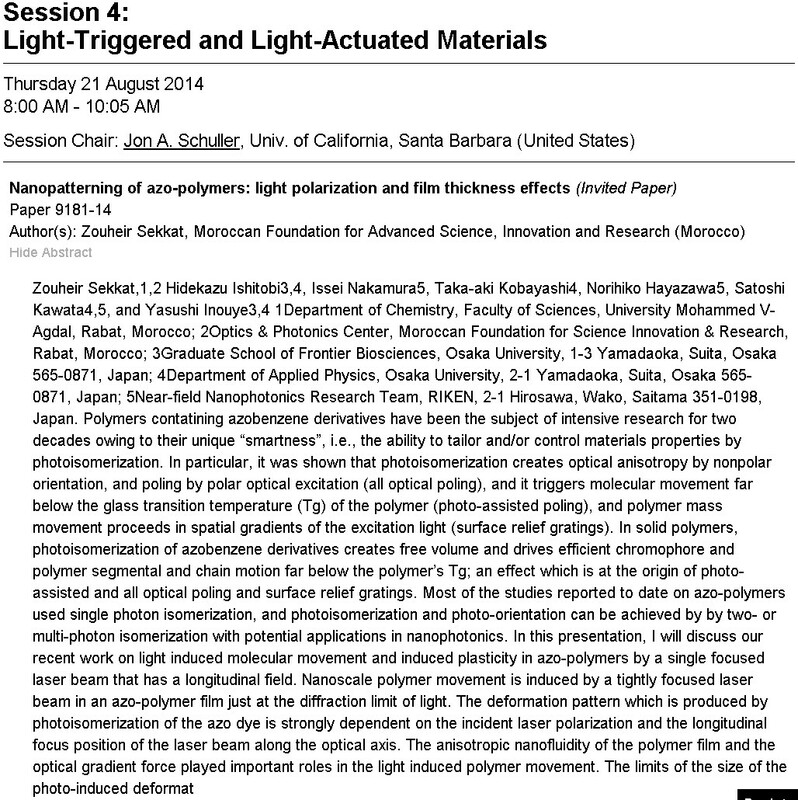 & Kawata, S. Laser nanofabrication in photoresists and azopolymers. 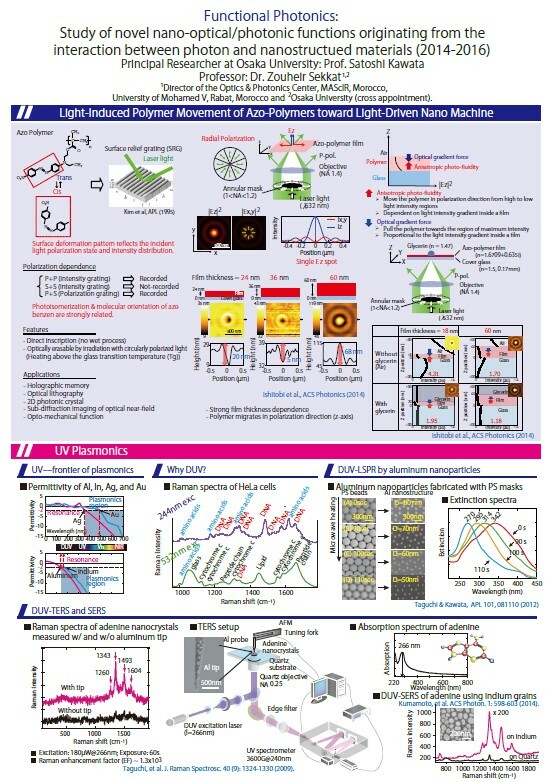 Laser & Photonic Reviews 8, 1–26 (2014). 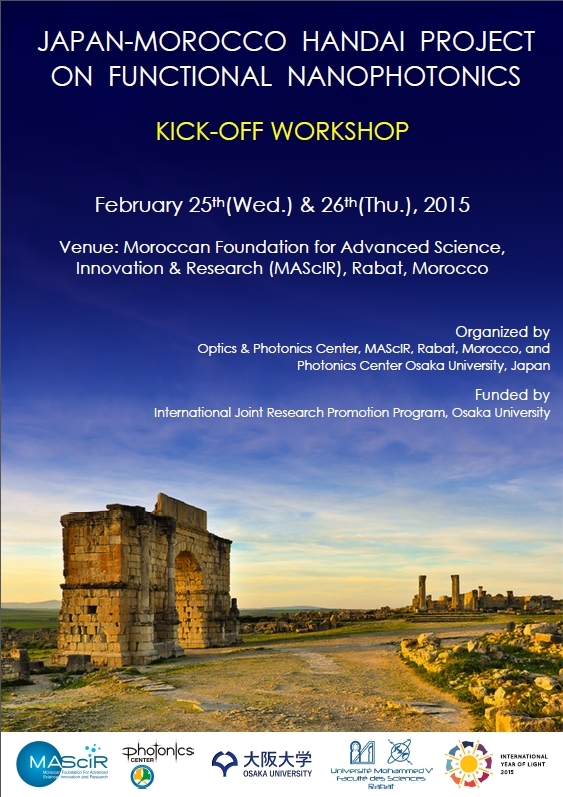 On behalf of "Japan-Morocco Handai Project on functional nanophotonics", I had the 2-month business trip to MAScIR (Moroccan Foundation for Advanced Science, Innovation and Research) located in Rabat, Morocco. My research task there was to establish high-sensitive pH detector based on SPR (Surface plasmon resonance) sensor. A pH-active molecule used in my laboratory was applied as a sensor layer on thin metal layers designed in MAScIR. Although we are still on the way to conclude about feasibility of pH detection, high sensitivity in SPR sensing with the designed metal layer was indicated by sensing assembly process of the molecules on the metal layers. 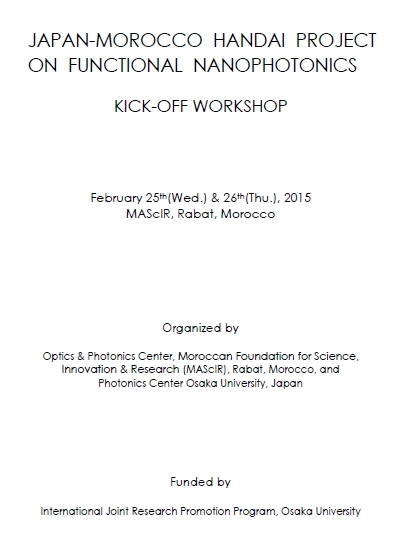 I'm really glad and excited with this good collaboration between Japan and Morocco, and we will keep on this research with contacting each other. 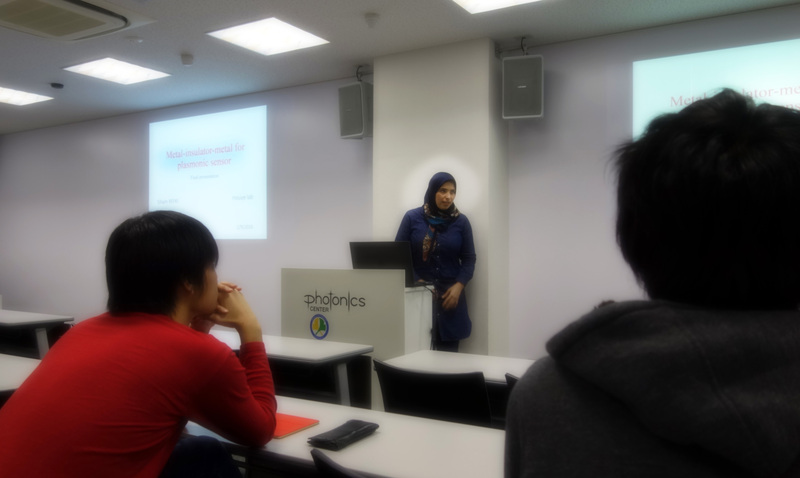 Ms. Siham REFKI gave a talk "Metal-Insulator-Metal for Plasmonic Sensor" at the meeting of photonics laboratories on 9th Feb., 2015. She worked at Inouye Labratory/ Photonics Center during 2015.05.15 - 2016.02.15 (9 months）. 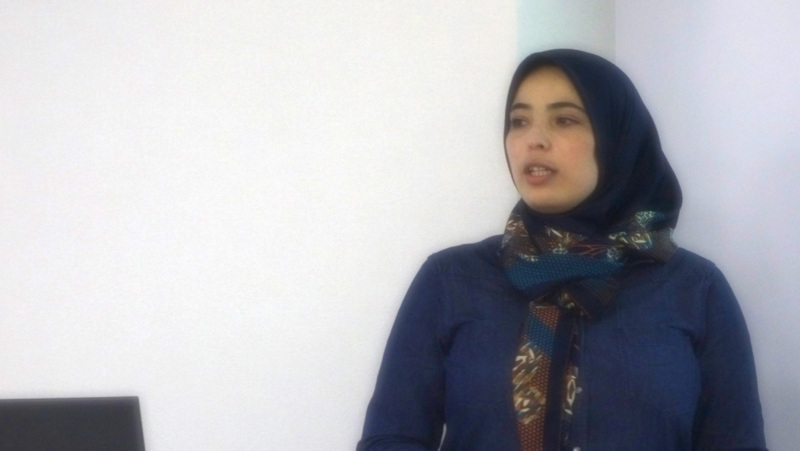 Her main theme of research : "Study of plsmonic structures for biosensing applications." 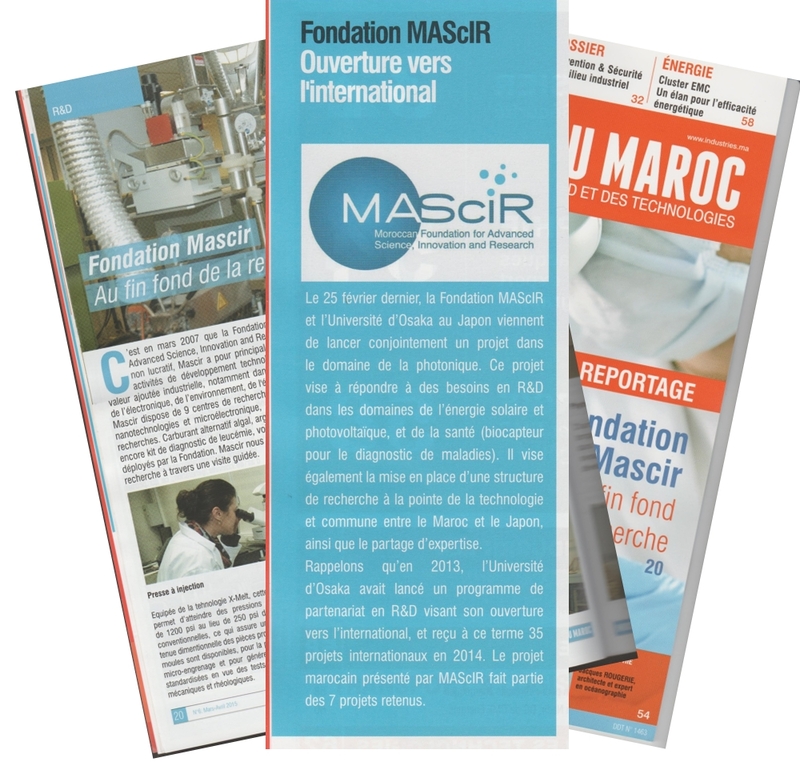 Our Handai project has been introduced in the Moroccan Journal "Industrie du Maroc" (Industry of Morocco). 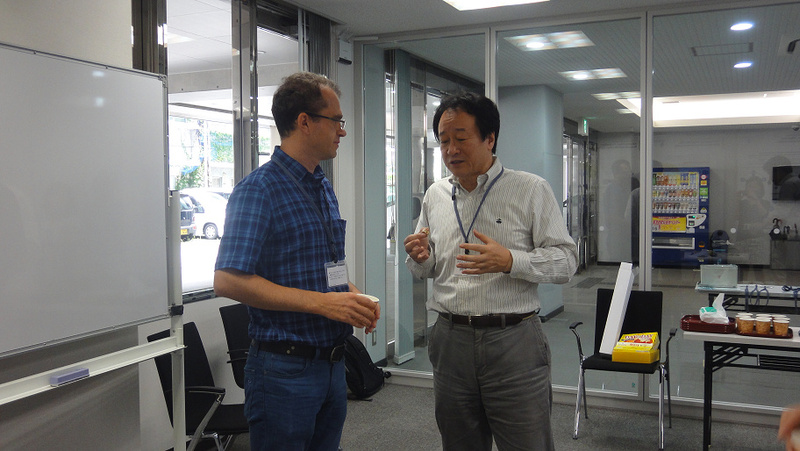 Prof. Zouheir Sekkat visits Osaka University during 12/7-22, 2014. He is now Appointed Professor of Osaka University by the cross-appointment contract (2014.12.01〜). 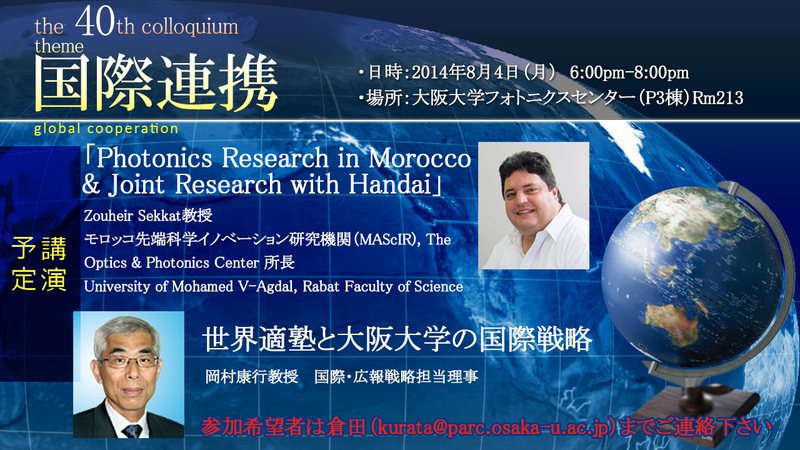 During his stay in Osaka , he promotes joint researches with researchers and students of Osaka University. 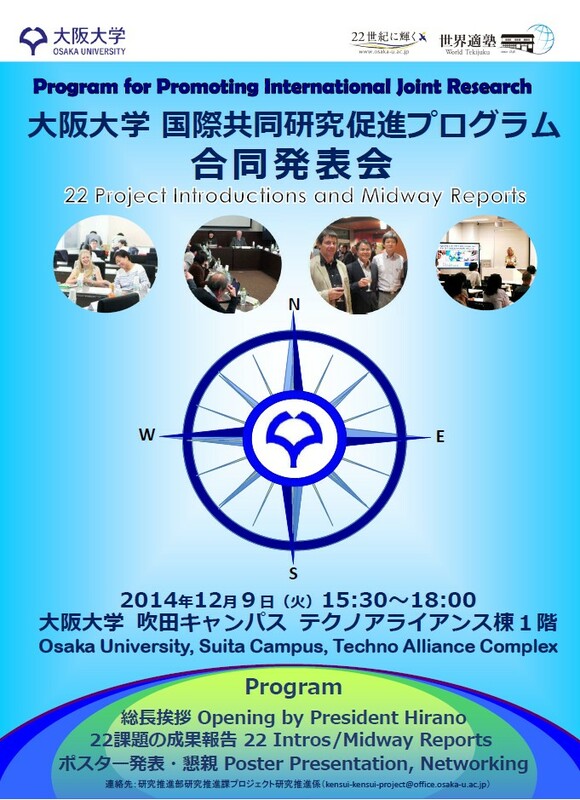 He introduces our project and gives midway report / future plan at the Joint-Meeting of the Program for Promoting International Joint Research of Osaka University where all 22 project members gather together with Prof. Hirano, the president of Osaka University and Prof. Aimoto, the vice president of Osaka University at the Techno Alliance Complex on 9th December. 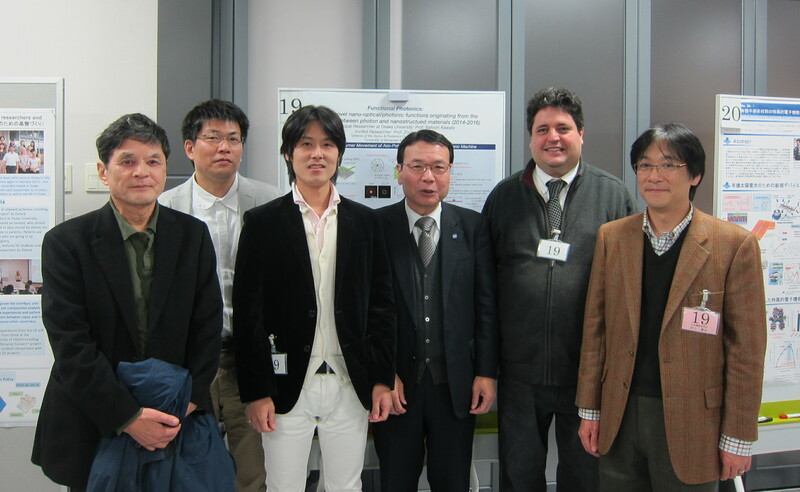 Photo shown right: the members attended from our project with Prof. Aimoto in front of our Poster presentation, Prof. Inoue, Prof. Sekkat, Prof. Aimoto, Prof. Taguchi, Prof. Ishitobi and Prof. Iwasaki from the right to the left). 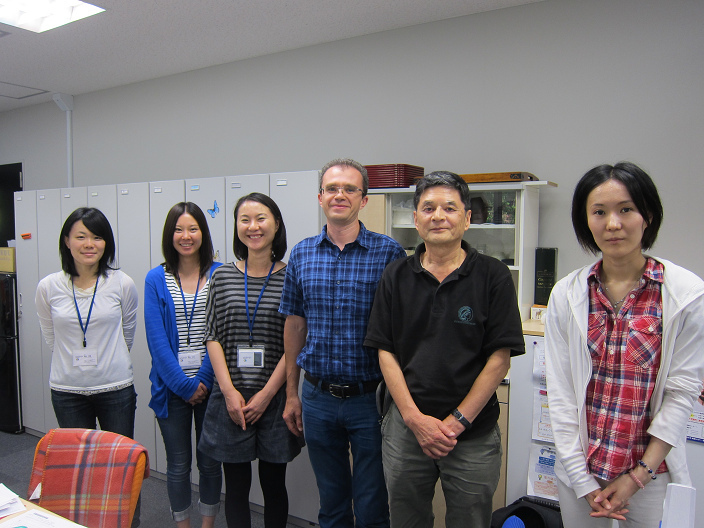 He joined TMT (Tuesday Morning Tea) and discussed on our program promotion with Prof. Kawata and Staff Aya Hirono. 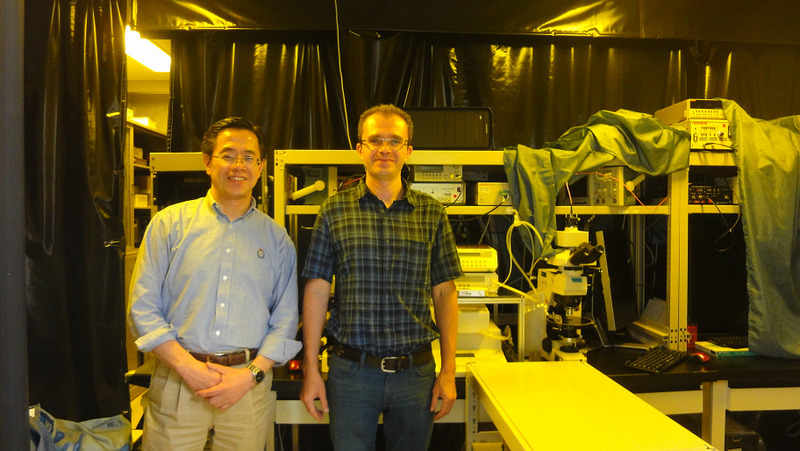 A paper (Applied Physics Express) with Handai affiliation has been published. On 4th November, Prof. Sekkat was named as a member of African Laser Centre Board of Directors as the Vice-Chairperson of the Board. 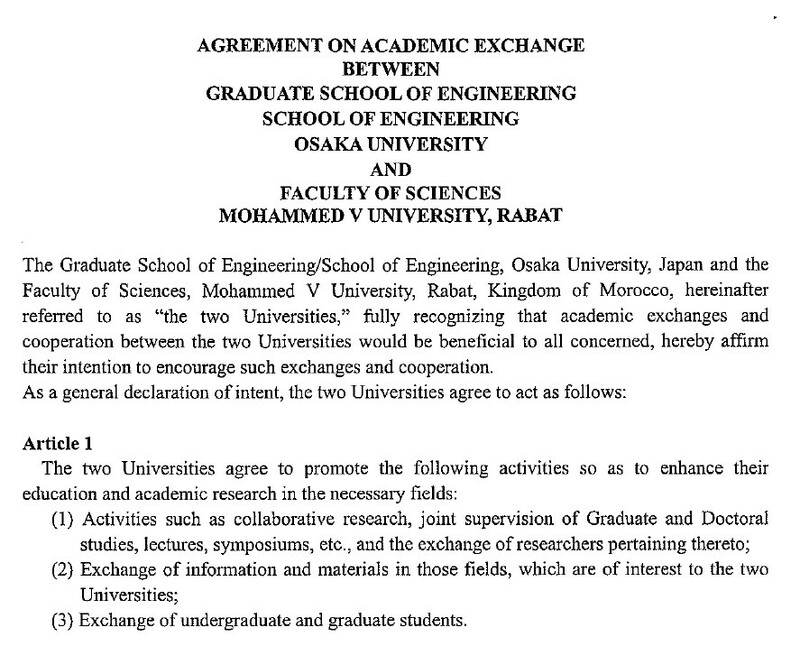 Agreement on academic exchange and MoU on student exchange has been concluded between Faculty of Sciences, Mohammed V University, Rabat and Graduate School of Engineering, Osaka University as of October 17th. 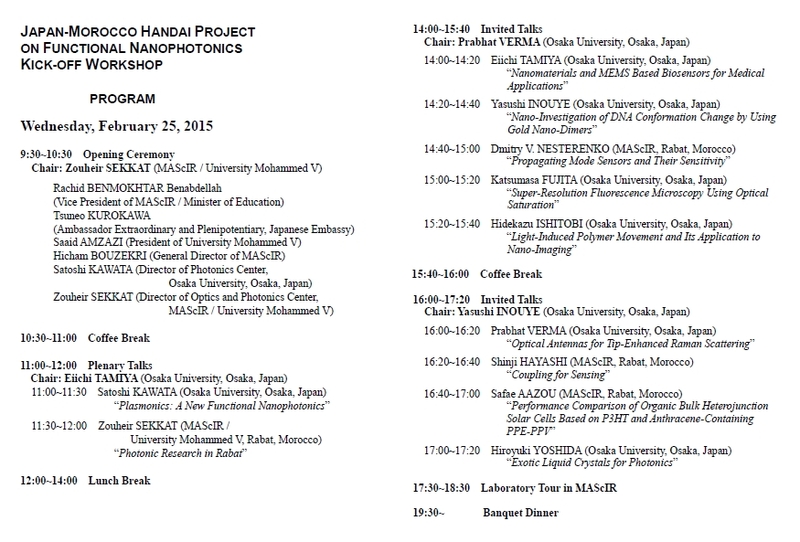 Under the Osaka University International Joint Research Promotion Program, Nono-functional Photonics: study of new nano optical/photonics functions originating from the interaction of photon and nano-structured materials, Prof. Shinji Hayashi, Ms. Refki Siham(D1), Mr. Ajjammouri Tarik(D2), from The Morrocan Foundation of Advanced Science, Innovation and Research (MAScIR)/Mohammed V University, Morocco, are visiting Photonics Center from Sep 8th (Mon) to Sep 30th (Tue). 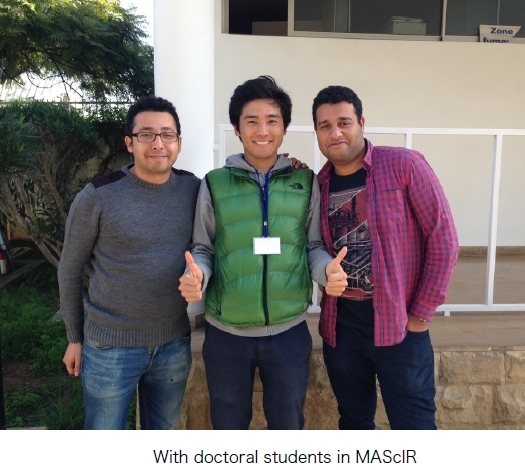 During their stay at Osaka University, the students will work on our joint research in each lab (Mr. Ajjammouri will visit Kawata/Fujita Lab, Ms. Siham will visit Inouye Lab) with using their equipment under the guidance of Prof. Hayashi. 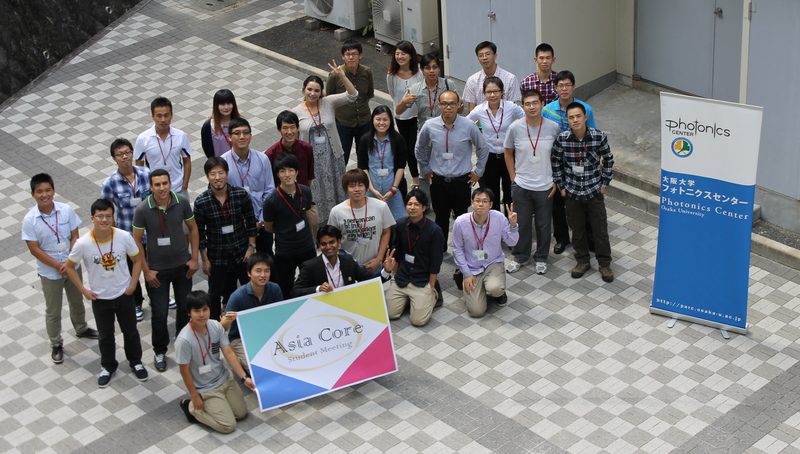 Also, the students will join the Asia Core Student Meeting (held in PARC on Sep 13th, in Hokkaido from Sep 14th to 16th) and Prof. Hayashi and Ms. Refki Siham will give talks about the achievement of the joint research at JSAP Autumn Meeting/JSAP-OSA Joint Symposia which will be held at Hokkaido University. 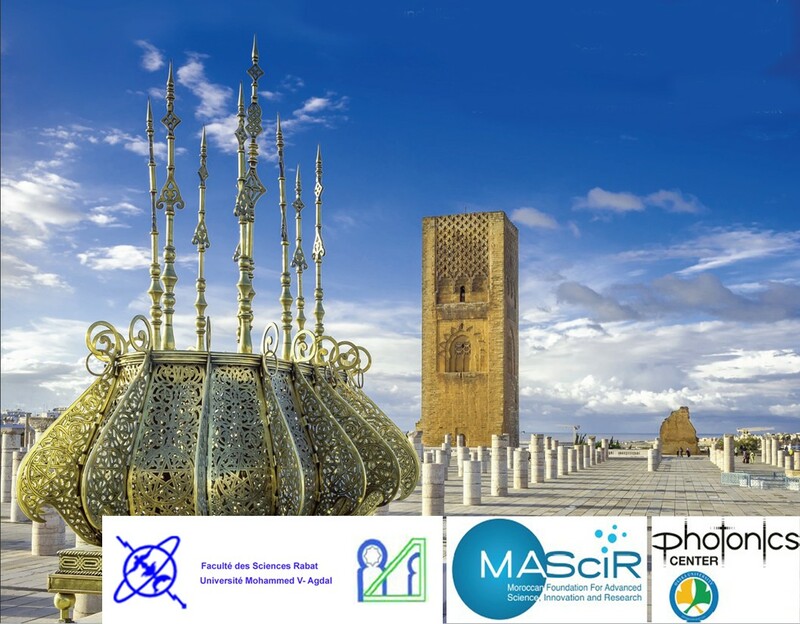 It will be expected that the research will exchange actively for the further achievement between MAScIR/Mohammed V University and Photonics Center and the students will spent fulfilled time during their stay. 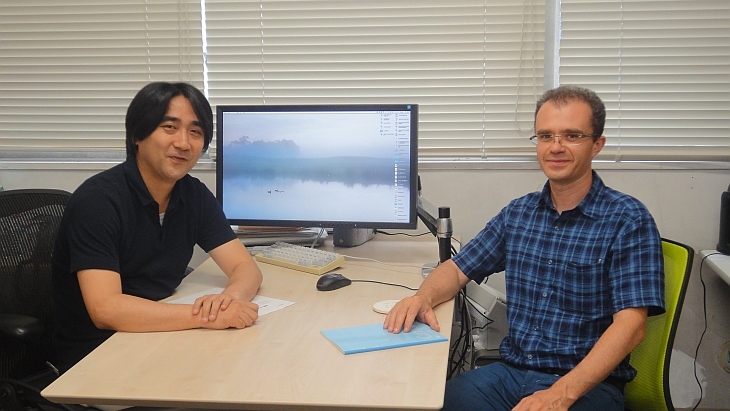 Prof. Zouheir Sekkat are going to visit Osaka University in coming August. 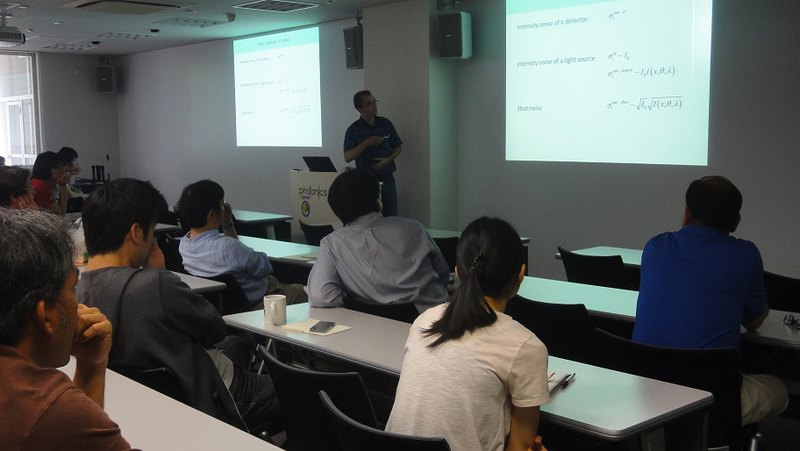 During his stay in Osaka , he will give a lecture at intensive course for students of Osaka University and also give a talk at PARC colloquim. He will also attend SPIE meeting at San Diego, August 17th- 21st to give an invited talk on a collaborate work and chair a session. Nanopatterning of Azo‐polymers: Light Polarization and film thickness effects. Prof. Zouheir Sekkat and his colleagues Prof. Hayashi and Dr. Nesterenko are going to present their research results at the META 14 in Singapore as shown bellow. 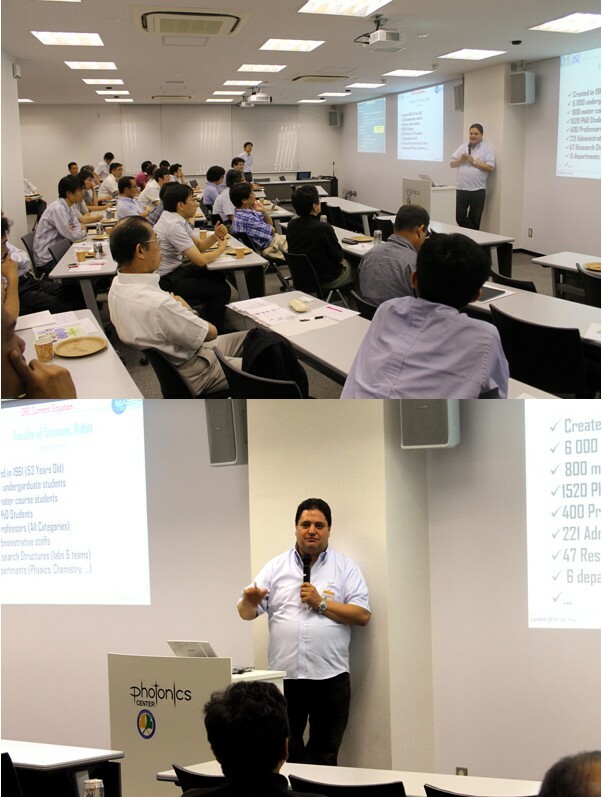 Dr. Nesterenko will visit Osaka University to do joint research after the conference (May 24th-30th). 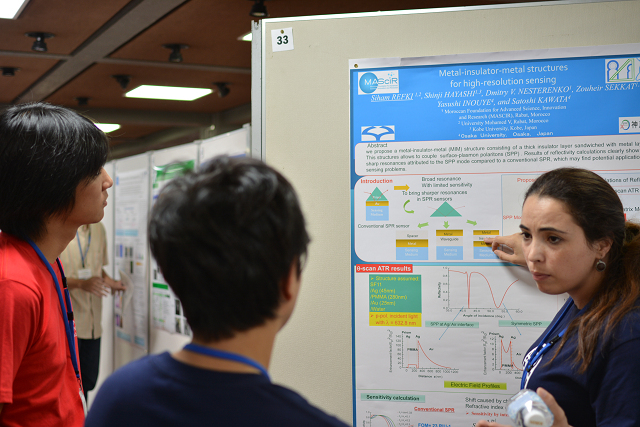 Abstract: Most current theoretical performance analysis of optical resonance sensors (ORSs) is focused on characteristics of resonance response (width of the resonance curve, spectral sensitivity, relation of the spectral sensitivity to the width, relation of height of the resonance dip to the width. However, the aforementioned parameters of the resonance curves have only indirect relation to the resolution of a ORS in common case. We establish a new approach to really estimate the achievable resolution of any types of ORS structures based on the analysis of their resonance response (including Fano type resonance). The figures of merit (FOMs) are introduced for estimation of the resolution for intensity modulation and resonance value modulation with post-processing of bulk media and thin film sensing. The presented approach allows optimization of ORS structures, numerical comparison of their resolution. We report on a unified approach for estimating achievable resolution of optical resonance sensor (ORS) structures based on the analysis of their response independently on noise properties of the light source and detector.The figures of merit (FOMs) are introduced for characterization of bulk media and thin film sensing by spectral modulation (SM) and data post-processing, and by intensity modulation (IM). The comparison of the resolution of different types of ORS is performed by numerical simulation. 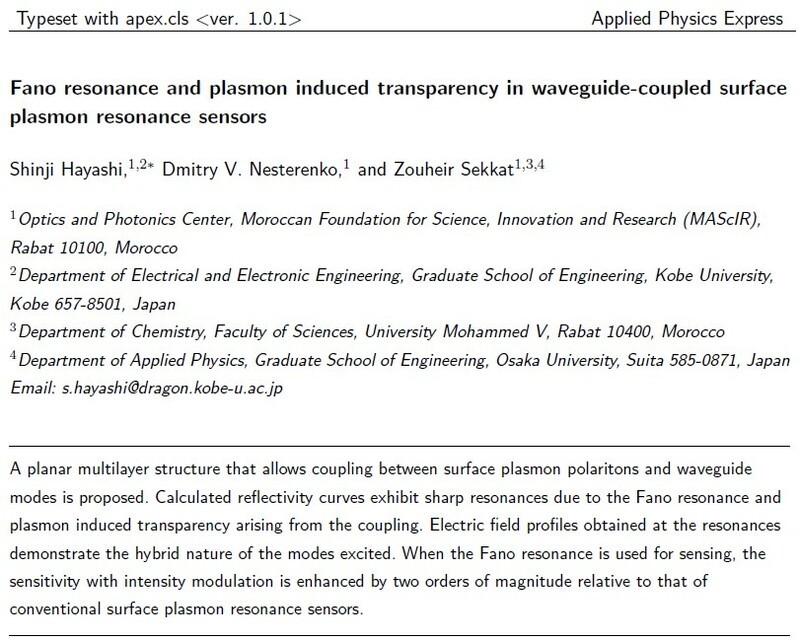 We propose a planar structure that allows us to couple a surface plasmon polariton (SPP) mode to a waveguide mode (WGM). 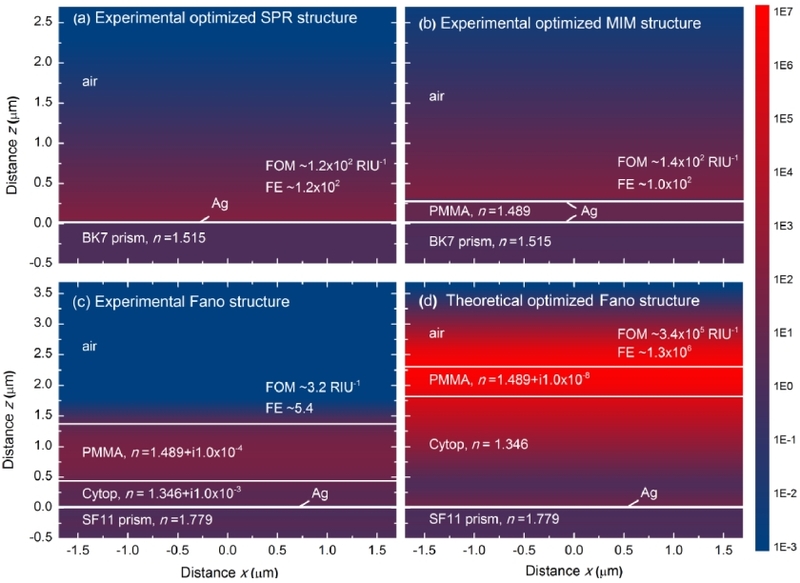 Results of reflectivity calculations clearly show very sharp resonances attributed to the Fano resonance and electromagnettically induced transparency (EIT), which may find potential applications in sensing problems.